B.F. Nelson Park	Acquired in 1987, this park lies between Boom Island and Nicollet Island along Historic Main Street. The Pioneer Statue by John K. Daniels was first unveiled in 1936 and commemorates the courage and hard work of early settlers to the area. It is carved from Minnesota granite, weighs about 500 pounds, and is over 23 feet high. The statue depicts a pioneer family of three generations holding a rifle, axe, and the handle of a plow. Below, a Native American chief offers a peace pipe to Father Hennepin. Sheaves of grain represent the industry on which Minneapolis was built. Name: The park site has always been referred to by the name of the man whose eponymous business operated on the site from the late 1800s. Benjamin Franklin Nelson built a thriving paper mill and roofing materials business on the site in the 1880s. Prior to that it had been the site of sawmills. Nelson was active in city affairs at the time. As a city alderman, he was an ex-officio park commissioner on the first park board in 1883. He was subsequently chosen by the park board to fill the term of Andrew Haugan, one of the original twelve appointed commissioners who had resigned from the board. 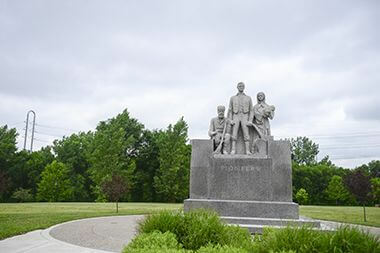 Nelson was one of three commissioners who selected Logan Park as the site of the first park in what was then called the East Division of the city. Nelson also served for many years on the school board. The site was acquired in a purchase and trade with the Minnesota Department of Transportation in 1987. The land had originally been included in the St. Anthony Historic District, but was excluded in 1973 when the land was acquired by the state for a planned I-335 freeway across northeast Minneapolis to connect I-35W to I-94 west of the river. The site would have held the east end of a bridge across the river for that freeway. The manufacturing buildings on the site were demolished at that time. In 1987, however, as Boom Island Park to the north of the site and the West River Parkway across the river were being developed by the park board, the state contacted the park board with an offer to sell the B. F. Nelson land. Plans for I-335 had been abandoned, so the state no longer needed the land. It had also learned that a proposed change in federal policy made it wise to sell the land quickly. When the land was acquired for a freeway, the federal government paid ninety percent of the $5 million cost, with the state paying the rest. Until 1987, the federal government had permitted states to sell land that was no longer needed for freeways without reimbursing the federal government for its share of the purchase price. But the state’s transportation department said it had learned that the federal government was about to change its policy and require reimbursement for its investment. 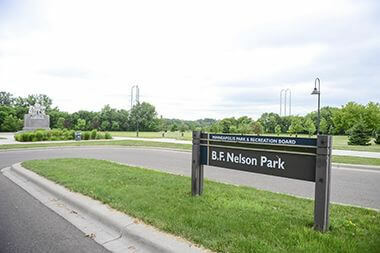 Before that change would take effect, MnDOT said it would sell the park board the B. F. Nelson site for the state’s investment, which was only ten percent of the original cost. But the state had other motives, too. It needed a bit more park land from The Parade for the construction of I-394 west from downtown. 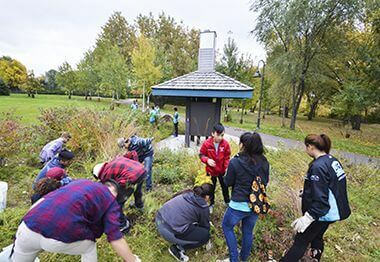 Moreover, it had not been successful in the remediation of some polluted industrial land it had promised to turn over to the park board as part of an agreement for taking a portion of North Mississippi Park for freeway I-94 in 1974. The state ultimately sold the B. F. Nelson site to the park board for a little more than $200,000, plus land at The Parade land and the polluted land near North Mississippi Park. A path, river overlook and fishing dock were built in 1996, in part with funds from the city’s Neighborhood Revitalization Program through the St. Anthony West Neighborhood Organization. Environmental testing of the land as a “brownfield” took place in 2001. 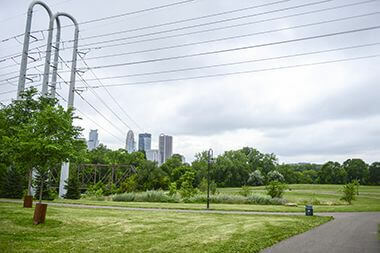 In part because of buried industrial waste from years as a manufacturing site, the master plan for the area is to leave it primarily as a greenspace connecting Boom Island Park and Nicollet Island. 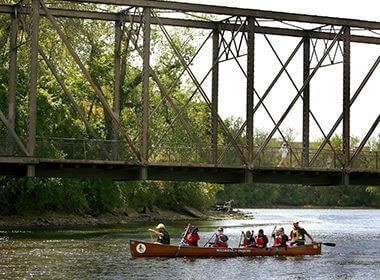 In 2006, the park board received a grant of $775,000 from the Mississippi Watershed Management Organization for initial design and development of the site. 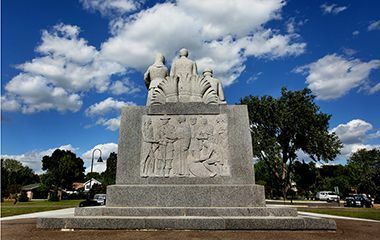 The St. Anthony West Neighborhood Organization raised funds to refurbish and relocate the Pioneer Statue to the park from its location at Pioneer Triangle across Marshall Avenue from the park. The statue was moved to its new home in 2010 at the beginning of development of the park. The area around the statue was landscaped and a parking lot was built nearby in 2011. In addition new trails were created through the park in conjunction with improvements to the adjacent Boom Island Park. The Green Team is a 9-week summer program with additional monthly service learning projects during the school year. Canoeing along the Mississippi River. First unveiled in 1936, the statue commemorates the courage and hard work of early settlers to the area. Enjoy a stroll along B.F. Nelson Park's paved walking trails, which connect to adjacent Boom Island Park. The statue is carved from Minnesota granite, weighs about 500 pounds, and is over 23 feet high. 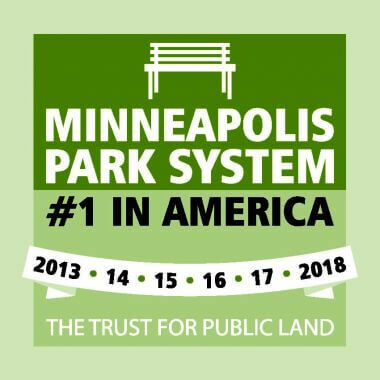 The park is primarily a greenspace connecting Boom Island Park and Nicollet Island.